WATCH: MPUMI'S BLIND FOR LIFE! NOMPUMELELO Khoza may have lost her eyesight, but she hasn’t lost sight of her goals. The 20-year-old from Etwatwa, Ekurhuleni, went blind in 2013 when she was 14 and had to drop out of school. Nompumelo had just passed grade 7. She wants to go back to school and to pursue her dream of becoming a singer. 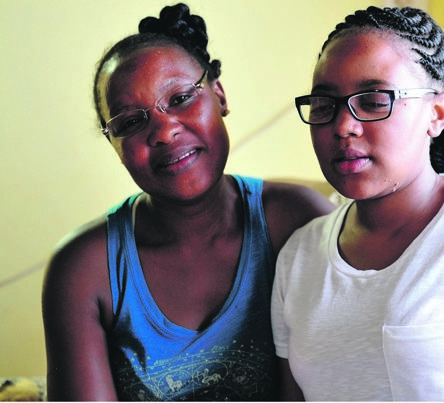 Before she went blind, she was short-sighted and underwent treatment at the Tambo Memorial Hospital in Boksburg, Ekurhuleni. After the two-year treatment Nompumelelo underwent an operation, but her vision faded away weeks later. Her mum Yvonne said she had tried to get a special school for her daughter in Tshwane but was told she was too old. She said that she misses being able to move around unaided. Tambo Memorial Hospital CEO Vis Naidoo said Nompumelelo had her consultation at the ophthalmology clinic on 26 July 2013. The assessment revealed there was almost no vision in either eye. “Causes of the deteriorating vision were due to uveitis and dense cataracts in both eyes,” Naidoo told the People’s Paper. He said at the redress meeting on the 8 February 2019 her mother was aware of the nature and the extent of her illness. Naidoo said Nompumelelo requested assistance from the institution for enrolment to attend a school for the visually impaired, visual assistive devices and adaptive dwelling. “She was referred to the institution Social Work Department,” said Vis.